2010 Food Crisis for Dummies: The world is blissful unaware that the greatest economic/financial/political crisis ever seen is a few months away. While it is understandable that general public has no knowledge of what is headed their way, that same ignorance on the part of professional analysts, economists, and other highly paid financial "experts” is mind boggling, as it takes only the tiniest bit of research to realize something is going critically wrong in agricultural market. Wisconsin Farm Bureau: It is so unusual for corn harvest to stretch into December that USDA had no year ago or five-year average harvest progress comparisons. Wet weather has plagued harvest in parts of the Midwest and Great Plains. 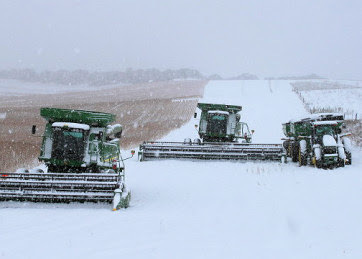 North Dakota corn harvest stood at just 60 percent, while South Dakota stood at 82 percent and Wisconsin at 85 percent. Another example of trying to define computer modeling as science with disastrous results. Unfortunately, Samuelson’s influence was not as positive as the Times would have it. Samuelson turned economics from a social science that tried to figure out how the world worked into an pseudo-science that tried to turn the world into a mathematical model — a model that failed to account for the realities of individual human desires, incentives, and diversity. As a result, by 1960, economists, politicians, and would-be central planners were misled into viewing the economy as a machine that could be controlled by pulling levers, i.e, passing laws, issuing regulations, and setting tax and discount rates.